Runners love to run. And runners love to race. According to Running USA, over 19 million people in the U.S. alone finished a running event in 2013, a staggering 22.5% increase over the previous year. The half marathon distance alone welcomed nearly two million finishers, roughly the same as its 10K and marathon counterparts combined. These numbers have risen steadily since 1990, and show no signs of declining any time soon. To borrow a term from the Brits, that’s a shedload of dopamine. Shown below are examples of a race details page, our Find a Race feature and the My Staging Area page, to give you a better sense for the site’s layout and features. Besides, 3 pictures = 3,000 words we don’t have to write and you don’t have to read. RaceRaves was born of both frustration and aspiration. Frustration with the status quo – with scouring the Internet trying to piece together the pros and cons of a given race, to determine which races to run and how to prioritize different races given limited time and resources. The problem wasn’t in finding races to run or information on a particular race – as with so many topics these days, access to information isn’t necessarily the bottleneck. The problem was that this information is largely fragmented and fleeting – a here-and-gone Facebook post, a recycled or buried magazine article from sometime last year. And you’re likely to miss out on valuable insights if you limit yourself to the first few results of every Google search. Who has the time, interest or even attention span to devote to this excavation process, anyway? From this frustration arose the aspiration that we could build something better, something that we and our running friends would legitimately want to use ourselves. So we took Socrates’ advice to heart and created RaceRaves. And by “all runners”, we mean ALL RUNNERS. From the fresh-footed rookie who just notched their first half marathon, to the sure-footed ultrarunner with 50+ finishes and counting, to the itchy-footed adventurer who travels to run and runs to travel. Whatever your story, don’t sell yourself short – other runners want to hear it. Because your story may very well change someone else’s. 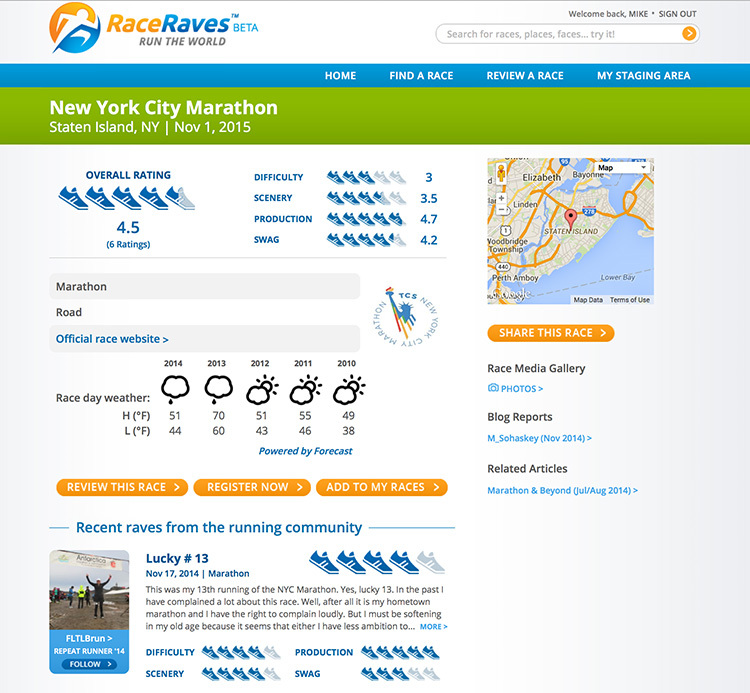 Signing up for a RaceRaves account is always free and easy, and enables you to rate and review races, create your My Staging Area page, interact with other members and respond to editorial content. Find like-minded bloggers (Hey, she also ran Chicago and Big Sur this year, I should check out her blog…). Unlike other race websites which tend to focus on a single distance, region or country, we’ve already built a diverse database containing well over 10,000 global running events. We may or may not yet have your local 5K or 10K (though we’re happy to add it if you submit it! ), but our more thorough coverage of half marathons, marathons and ultramarathons is certainly nothing to blow a snot rocket sneeze at. The races in our database range from the top of the world to the bottom of the ocean. And thanks to an eclectic cast of thoughtful beta ravers, RaceRaves is off to a fast start. Recently on the same day, members reviewed the Marrakech International Marathon in Africa, the Ragnar Relay Napa Valley and Nanny Goat 24-Hour Ultra in California, and the Krispy Kreme Challenge in North Carolina. It was a mini eureka moment, an early glimpse into the site’s potential value to all runners. 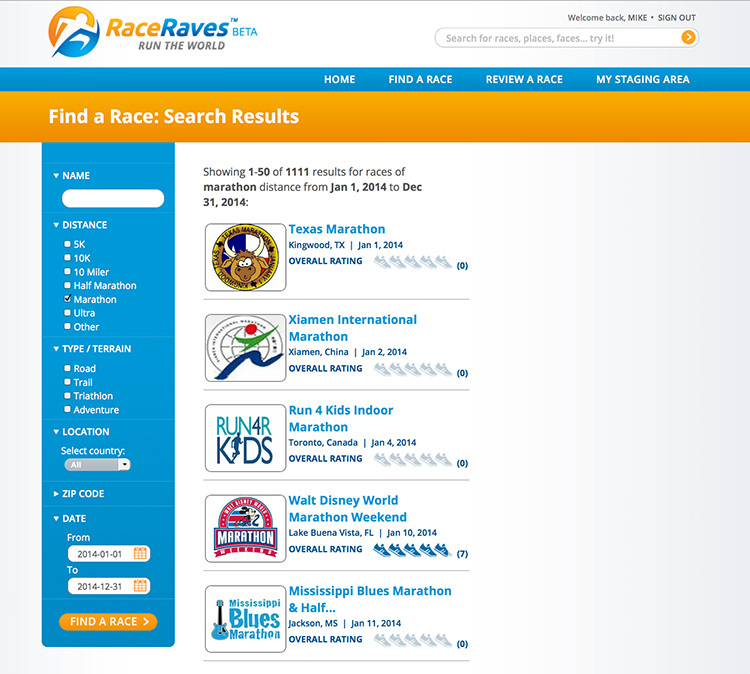 A diverse catalog of races demands a powerful search engine to find them. No we’re not Google, but our Find a Race feature makes it easy to customize your search to discover new races – by distance, by terrain, any day, anywhere. Try it yourself and let us know what you think! RaceRaves v1.0 features a robust, scalable platform with an intuitive interface, a host of core features and a global database of races. That said, we’re committed to evolving and improving the site over time, with our sights set early next year on enabling runners to more easily find and connect with each other. After all, there are no strangers here – only friends you haven’t yet met. At the same time, with new running events popping up like Whac-A-Moles, we’ll continue to expand our global database of running and endurance events, including triathlons and adventure races. And we have some other tricks up our compression sleeves in our ongoing quest to cultivate the best possible online race community, and a fun gathering place you’ll look forward to visiting again and again. So welcome to RaceRaves! Thanks for checking us out and for spreading the word far and wide, to every runner and triathlete you know. If everyone reading this told 5 runner friends, and each of those 5 runner friends told 5 other runner friends, and so on… well, let’s just say we’d be mighty appreciative. And speaking of appreciative, we owe a debt of gratitude to Matt LaRusso, Jen Lee, Chuck Sohaskey and Dan Solera for going above and beyond to help bring RaceRaves v1.0 to life. As our tagline suggests, we’re here to help you run the world. What happens on race day – well, we’d love to hear all about it. See you at the finish!